Are you getting a lot of hummingbirds at your feeders now? We are here in Kentucky. In fact my husband and I are filling up our feeders every day now. We don’t mind because it is that time of year when the adults as well as the young are now coming in. This means continuous visits to our nectar feeders and to the many nectar producing flowers around our garden. Every time I look outside I can see a hummingbird somewhere. I just love that! Come about late July/early August (meaning about now) Ruby-throated male hummingbirds will begin their fall migration from up north and will be heading southward to Central America and Mexico to their winter homes. The males are the first to leave then about three weeks later the females and juveniles will depart. So pay attention to your feeders and see if you notice a lot more males showing up as they stop by to refuel. That will be your sign that migration has probably begun. Well that plus a lot more hummers zipping around in your yard. During this time be sure to keep your hummingbird feeders replenished to help the hummers keep up with their energy levels for traveling. Interesting Fact: Hummingbirds travel solo during migration traveling about twenty three miles per day. They only stay in one place for about 24 hours at a time to refuel. 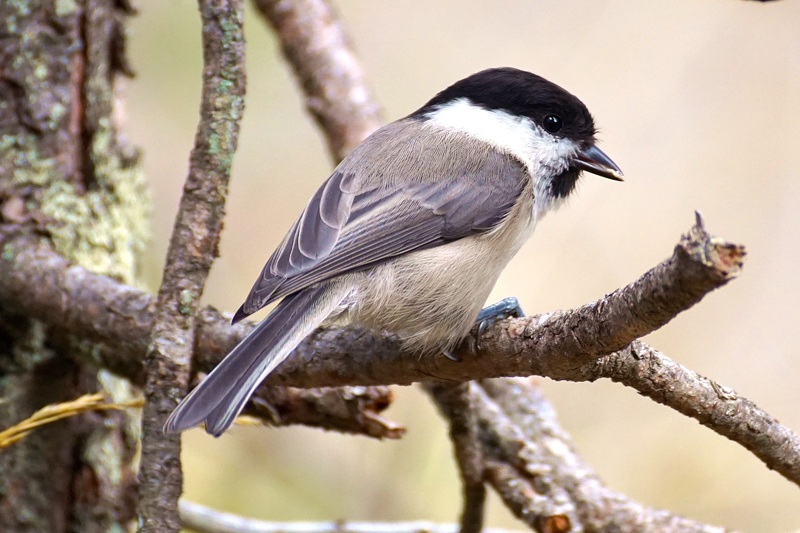 So you may not be seeing the same hummingbirds at your feeders every day. I have purchased two more flower pot tube feeders for my deck in anticipation of the fall Ruby-throated migration. There will be plenty of hummers buzzing about and I want to accommodate them. :-). Fall migration is about as exciting as the spring migration multiplied by ten. In the spring there are a few showing up (at least that is how it works for me) but in the fall they are aplenty! Now that is the good news! The bad news is that they will be leaving soon and who wants that right? Here in Kentucky the Ruby-throated Hummingbird will be here until about late September possibly early October if we are lucky. Yours may be sooner or later than that depending on where you live. How Do Hummingbirds Know When To Migrate? It is not known exactly how hummingbirds know when to migrate but studies have shown that it may have to do with their inner instincts as well as changes in daylight hours and food supplies. When all three of these are at play hummingbirds are ready to leave. 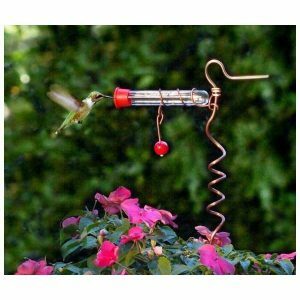 Just before hummingbirds begin to migrate you will see them feeding constantly at your feeders and at your flowers. They are building up fat and energy, gaining twenty five percent to forty percent of their body weight, just to be able to make their long journey to their winter homes (from 335 to 500 miles depending on where they begin). Interesting Fact: Hummingbirds tend to follow the same flight pattern every year. They remember where they found nectar the last time that they migrated through and generally return to the same areas for refueling, studies have shown. When Should You Take Down Your Hummingbird Feeders? Some people wonder when they should take their hummingbird feeders down? They worry that hummingbirds may end up staying over the cold winter and not be able to survive. 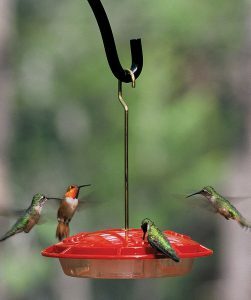 However, you do not need to take your feeders down until at least two weeks after you have seen your last hummingbird. You will want to make sure to take care of any stragglers passing through as they stop to refuel. The Ruby-throated Hummingbird is the only hummingbird found on the eastern half of the United States. However the Anna’s, Costa’s, and Rufous Hummingbirds have been known to show up at some feeders during the fall and winter months. There have been sightings of the Ruby-throated Hummingbird at feeders during the winter months. This is not a death sentence for them as they can survive due to what is called torpor. Torpor is when hummingbirds undergo an overnight metabolic change reducing their body temperature and metabolic rate in colder weather. A few years ago, we had a Ruby-throated Hummingbird coming in to our feeder all the way up until the end of November. Hummingbirds have a fast heartbeat, breathing rate, and a high body temperature. For that reason they need to eat often. Hummingbirds can fly at speeds of up to thirty three miles per hour. Hummingbirds are very territorial over their food supply and to protect their young. That is why you see them chasing and fighting other hummingbirds around at your feeders sometimes. To alleviate this put out more feeders up to make everybody happy. I have also found that more feeders bring in more hummers over time… so something to consider. 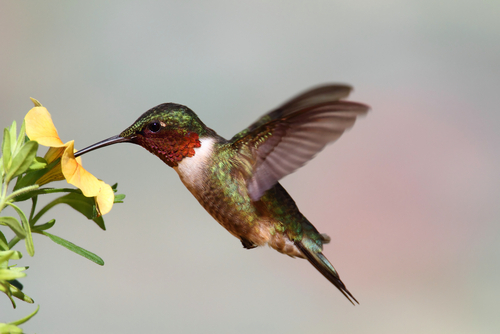 Hummingbirds do not drink nectar through their beaks as it appears. They actually lap up nectar with their tongues. Hummingbirds will fly non-stop over the ocean for five hundred miles or more. It takes about eighteen to twenty-two hours to make the journey. This is always a fun time to watch Ruby-throated Hummingbirds at the feeders and in and around the garden. There are more hummingbirds showing up now because you have the juveniles coming in to feed along with the adults. On top of that migration time is soon to begin and even more hummingbirds will be stopping by at the feeders. First the males, then about three weeks later the females and juveniles. There will be a continuous stream of hummingbirds for a while then it will start to trickle down until finally they are all gone. 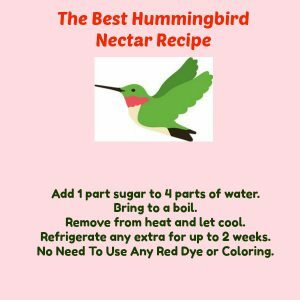 During this time be sure to keep your hummingbird feeders replenished for them so that they can stop and refuel before continuing on their long journey. Do you have anything to add to this post. Please feel free to make your comments below. Posted in Attracting Hummingbirds, Hummingbirds and tagged hummingbird migration, hummingbirds.